Q Switched Nd:Yag 1064 nm & 532 nm expandable Tattoo removal laser with 585 nm & 650 nm options. Utilize larger spot sizes, faster firing speeds up to 25 Hz, And greater power with up to a 10 mm circle spot size. Ultra short pulse duration of 5000 picoseconds means less laser tattoo removal treatments. Shorter the pulse duration = faster. Remove ink in virtually all tattoo. Add the optional 585 nm & 650 nm to remove more hard to target colors. Target pigmentation in darker skin tones with fractional HP and utilize PTP mode for energy outputs of up to 2200 MJ. 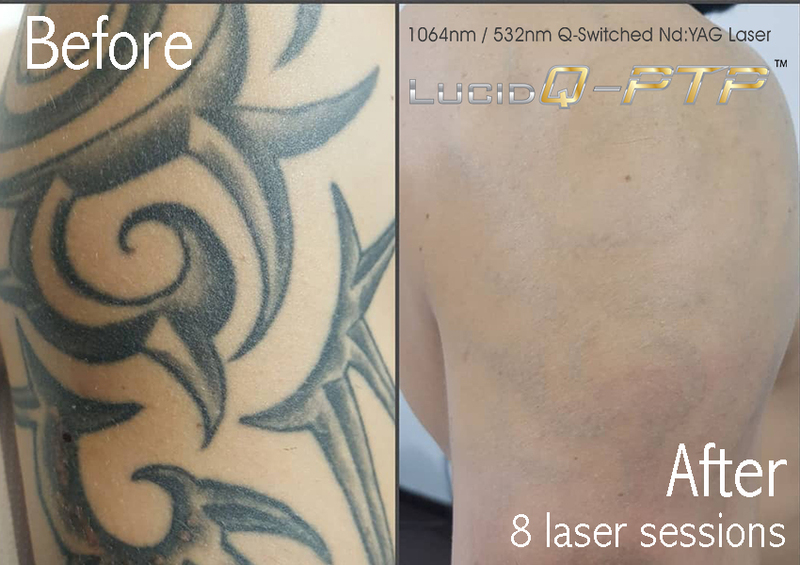 Powerful & Smart Hand Piece Design for Q-switch 532nm, 585nm, 650nm and 1064nm Wavelengths to complete the ultimate laser tattoo removal machine combination. Buy the best laser tattoo removal machine for your medical spa. 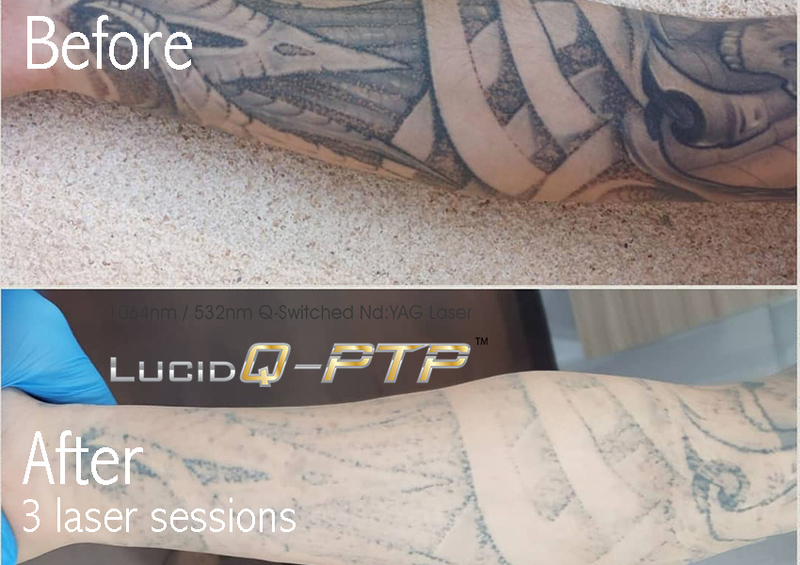 The Lucid Q PTP is luxurious, affordable, and effective FDA approved Q Switched laser tattoo removal machine available with 4 wavelengths: 1064 Nd:yag, 532 KTP, 585 Dye, and 650 dye. This device defines luxury at an affordable price compared to other lasers in its class. Removal virtually all tattoo colors and do more treatments like pigmentation, toning, peeling, carbon peeling, and facial vascular conditions. Lucid Q PTP laser tattoo removal machine replacement parts are a fraction of the cost as competitors. This means you will save significantly long term on parts and service. 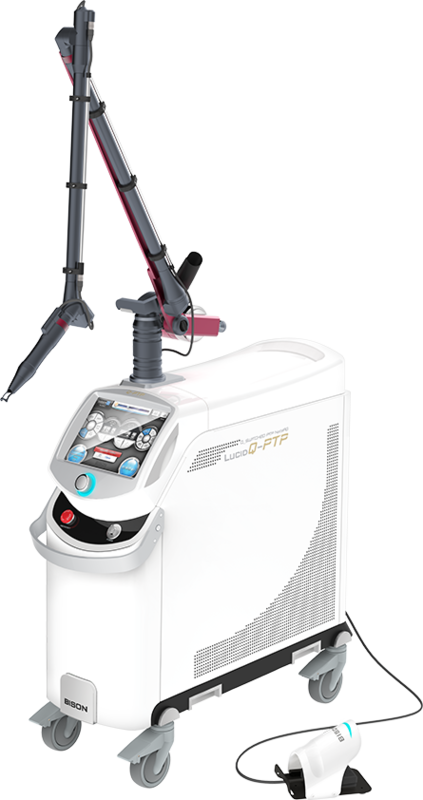 The Lucid Q PTP is the ferrari of laser tattoo removal machines without the six figure price tag. On average you will save 40-60% on total cost of ownership compared to other Q Switched lasers in its class. Put that money back into your pocket and see a higher ROI. The Lucid Q PTP laser tattoo removal machine doesn’t just remove tattoos, it offers many other treatment options. But you may be wondering what colors tattoos does the Lucid Q PTP remove? 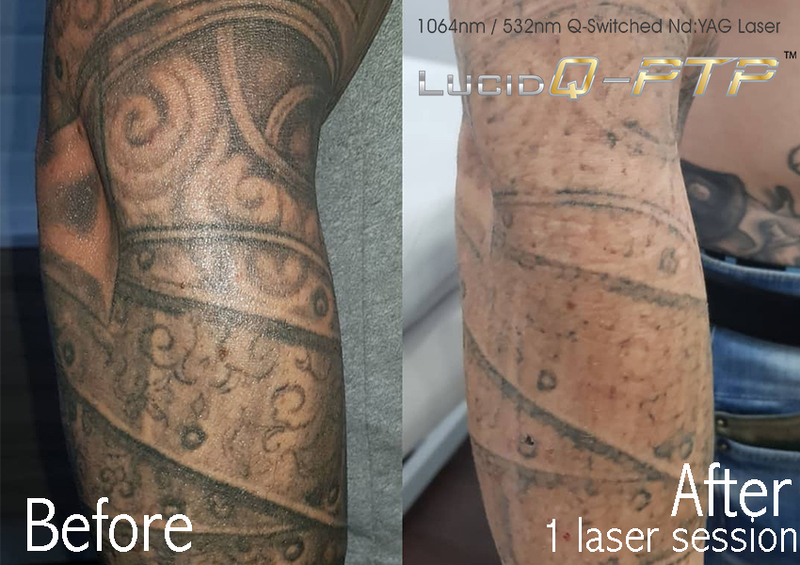 The Lucid Q PTP laser tattoo removal machine can remove a wide range of colors necessary to effectively offer permanent laser tattoo removal to your clientele at an affordable price. 532 wavelength removes : Browns, Reds, Oranges, Yellows, and Violets. The Dye Hand Pieces are an optional add on feature that provide enormous value to complete the ultimate laser tattoo removal machine. The addon Dye HPs will transform the emitted light/filter into 2 additional wavelengths of 585 nm & 650 nm. With adding on the Dye HPs you can transform the Lucid Q PTP into having 4 different wavelengths. 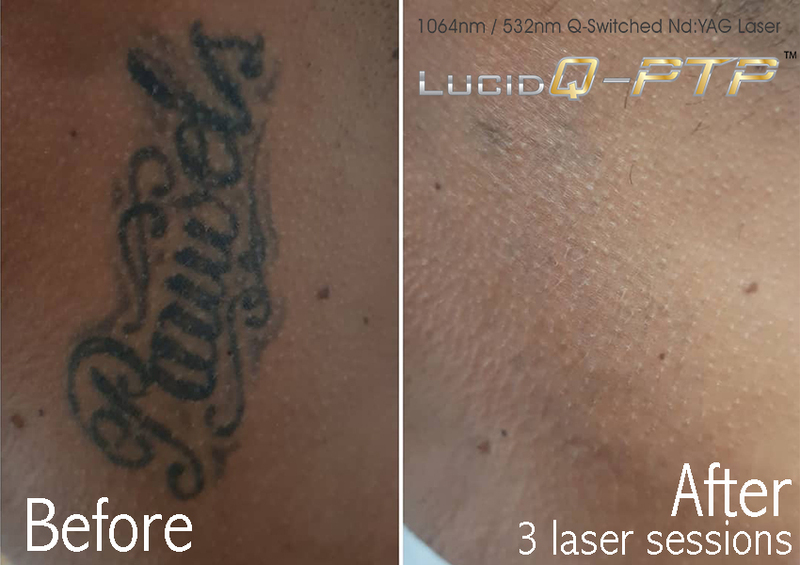 The Lucid Q PTP laser is the most affordable and effective Q Switched tattoo removal laser in its class. What Else Can the Lucid Q PTP Laser Do? 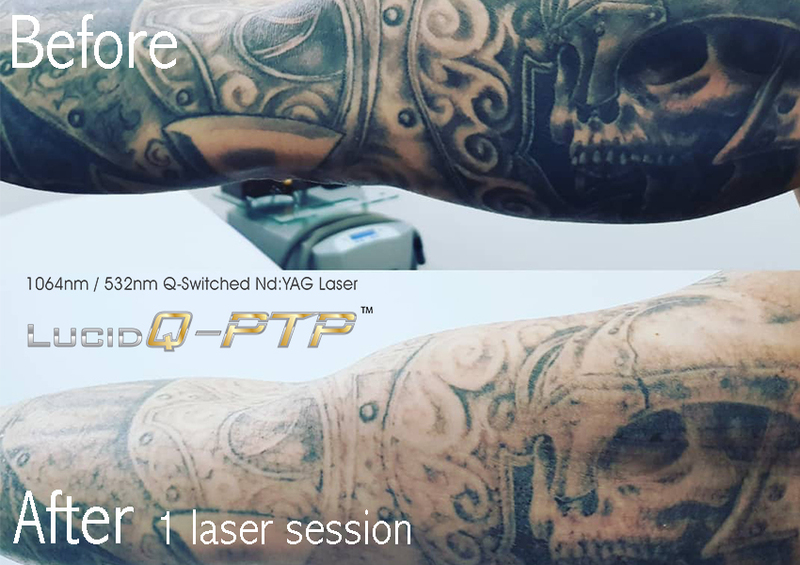 The Lucid Q PTP Laser isn’t just a laser tattoo removal machine. This device provides many other treatment options that you can add to your business. Additional treatment options are included: Toning & lesions such as melasma, hyperpigmentation, acne scar reduction, full face toning, acne removal, and genesis toning with the Quasi-Long feature. When adding on the Dye HPs you’re able to treat post acne redness, inflammatory acne, facial flushing, vascular melasma and more. Target epidermal pigmentations such as freckles, Cafe Au Lait spots, and seborrheic keratosis. You can provide Non-Ablative peeling, soft peeling, and carbon peeling for wrinkle reduction, pore reduction, and improving skin tones. Do more with the Lucid Q PTP laser tattoo removal machine. 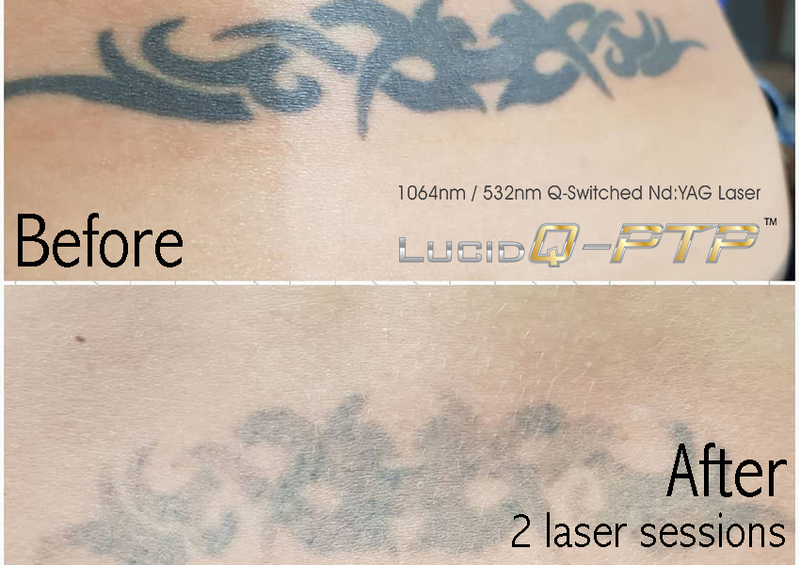 The Lucid Q PTP laser tattoo removal machine is one of the few Q Switched lasers that hosts the PTP feature. PTP stands for Photoacoustic Twin Pulse Mode also called PhotoAcoustic Technology Pulse on similar lasers of its class. PTP is a unique laser emitting mode in which double pulses are delivered within one Q-switching cycle. Each pulse has relatively weak energy compared to the standard single Q-switched beam, but they can transfer higher peak energy (up to 60% more) to the target melanosome than a single beam because double beams are successively irradiated at very short intervals (100~130 µsec) and their energy can be accumulated. As a result, the high peak energy instantly increases the temperature of the chromophore, leading to pressure changes and vibration, which then effectively destroys the chromophore through the form of a shock wave (photoacoustic effect) for different pigmentations like melasma. 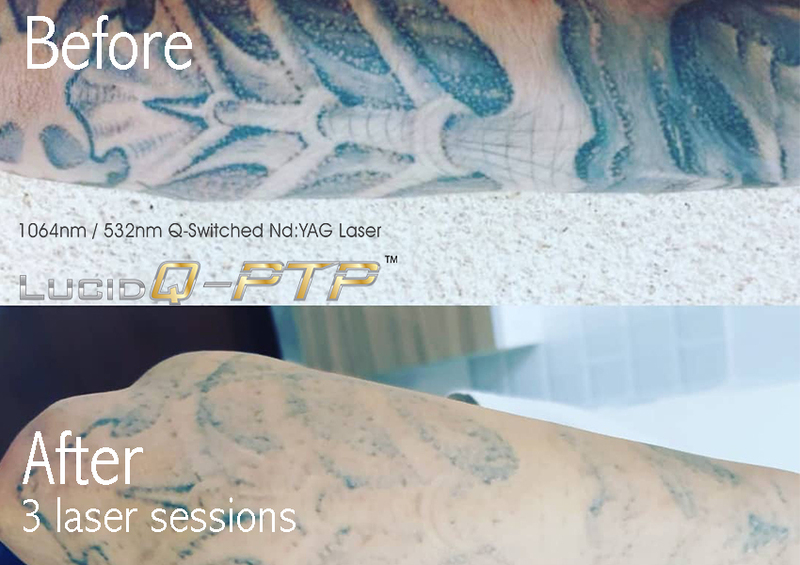 The Lucid Q PTP laser tattoo removal machine is the best laser for non-invasive laser treatments to deliver fast, effective and immediate results. Through a short 15 minute laser carbon treatment, our Lucid Q PTP technology offers aestheticians the ability to provide more treatment options all-in-one laser system. Grow your business through carbon peeling q-switch laser technology to cleanse pores, remove oils, exfoliate skin, eliminate blackheads, correct acne, tighten and rejuvenate patient skin!